Your exam should include an assessment of not just your teeth, but your gums as well. (Would a home inspector not look at the foundation of a house during an inspection?) The appearance or esthetics should be considered. Do you like the way your teeth look when you smile? Would you like them to be straighter? Whiter? Do you have a “gummy” smile? Are any of your teeth mobile? Do any need root canals? X-rays are a critical part of diagnosing dental disease. Diagnosing dental problems without x-rays is like working in the dark with your eyes closed. Of course nobody wants to be exposed to radiation more than necessary, but today’s x-rays allow us to see much more with much less radiation than years ago. Digital x-rays on the computer screen are enhanced and provide critical information. Cone Beam CT scans provide a three dimensional view of teeth and bone and are critical in the placement of dental implants, as well as helping to detect infections or other pathology that doesn’t show up on conventional x-rays. The way that teeth meet is a critical issue in your ability to chew and in keeping the dentition healthy long term. Often times, it is essential to get impressions for study models to best assess the bite situation. A two-way discussion with your dentist is so important. This lets the dentist know what your goals and desires are in regard to the future of your mouth. Time should be provided to ask any and all questions that you may have. This way, the dentist can formulate a treatment plan that will give you the results you are looking for. It is important to know what to expect from each visit. If you make sure that none of these key points are missing from your dental visit, you and your mouth are more likely to have a healthy and long-lasting relationship with your dentist. Dental Implants: Are They Always the Best Solution? At Greater Pittsburgh Dental Implants & Periodontics in Allison Park we have been placing dental implants for over 30 years. Even so, Dr. Weingarden and Dr. Bakuri will tell you that dental implants are not always the best treatment option. There are many factors that determine when a tooth should be extracted, and whether or whether not the best option for replacing them is the dental implant option. We’ve all seen advertisements for “same day, low cost, made affordable” dentures, and certainly these “denture mills” serve a purpose for people who have no other options for saving their teeth. As a matter of fact, patients often say to us, “Just take them all out”. Sometimes that is the only solution, when teeth have reached the point of no return. Then maybe full-mouth extractions with implant-supported dentures are the way to go. But what if some of the teeth are treatable? There may be other options that would provide a more comfortable and possibly even less costly plan than full-mouth extractions. But how does a patient know which treatment option will provide the most predictable, long-lasting results for them? 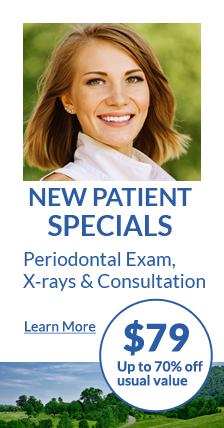 If you are frustrated with your dental situation or need help in finding out the best answer for you, consult with a good periodontist. They will assess your situation and discuss ALL treatment options. From there you can make an informed decision and one that you can live with for many years to come. Do you have missing teeth that you would like to replace? Are you unhappy with your current dentures? Do you have a partial that is driving you crazy? Well, you probably have heard that dental implants could be the answer to your prayers, but somehow you just can’t get up the nerve to find out more. Fear no more. At Greater Pittsburgh Dental Implants & Periodontics, the office of Dr. Mark Weingarden and Dr. Sam Bakuri, we understand your apprehension. That is why we take the time to reassure you that you can get rid of painful dentures or annoying partials, and experience the freedom that dental implants provide…and it is easier than you think! Our dental implant team is focused on your comfort before, during and after treatment. Before treatment, Dr. Weingarden or Dr.Bakuri will take time to answer all your questions and to put your mind at ease. During treatment, although nothing more than Novocain is necessary, we also offer IV sedation or oral sedation to help you relax or sleep through the procedure. After your implants have been placed, we provide medication for any post-operative discomfort, although the vast majority of our patients take nothing more than Advil. Dental implants have become the standard of care for replacement of missing teeth and patients love them! Whether you are missing just one tooth or all of your teeth, dental implants can provide the comfort and function of natural teeth. Dental implants can help you smile with confidence and to eat anything you want, including crispy apples and juicy steaks! If you are still hesitating, take a minute or two to read the many testimonials on our website from happy, smiling patients that took that first step and called us. And remember, beyond fear lies freedom! As you look through the phonebook and surf the internet you will see a number of dental offices in Pittsburgh that offer implant services. How do you decide which office to go to? How do you know who will provide successful and long lasting results? Here are a few reasons that you may want to consider Dr. Mark Weingarden and Dr. Sam Bakuri for your dental implant needs. Between them, Dr. Weingarden and Dr. Bakuri have over 40 years of experience in placing dental implants. Both doctors are board certified and have dedicated their careers to staying in the forefront of implant technology. Dr. Weingarden is the director of the Pittsburgh Dental Network and Dr. Bakuri is the director for the Pittsburgh Dental Horizon, study clubs that bring cutting-edge continuing education to the Pittsburgh dental community. Not every office provides 3D imaging. In the office of Dr. Weingarden and Dr. Bakuri, you will receive the most appropriate, state-of-the art diagnostics in the planning and placement of your dental implants. 3D imaging allows the doctors to determine the quantity and quality of the jawbone, as well as the ability to establish the location of the nerve that runs along the jawbone and the location of the sinuses, critical in the proper placement of the implants. This diagnostic tool is now standard-of-care in placing dental implants! Your team at the office of Drs. Weingarden and Bakuri is ready and waiting to show you just how easy and rewarding dental implants can be. We offer oral sedation, IV sedation, and even a cozy blanket! If you are still hesitant, visit our website at www.pittsburghimplantsandperio.com and read the many testimonials from our smiling dental implant patients. If you have other questions regarding dental implants in Pittsburgh just give us a call. I Think I Have Gum Disease: What Should I do? It is important to note that gum disease often has no symptoms. Sometimes there is redness, swelling, bleeding or bad breath. However, many times there are no symptoms to indicate there is infection or the symptoms may simply go unnoticed. For this reason, it is very important to see your dentist on a regular basis and to be sure you are being checked for gum disease. Checking for gum disease includes measuring the “pocket” depth, (the space between the gum and the tooth), with a little instrument called a probe and taking full mouth x-rays at least once every five years. These are the diagnostics needed to properly diagnose gum disease. If your dentist does not include probing in his examination, you may need to see a periodontist. Important note: Dental implants will never get a cavity, but they can be lost to gum disease! Once periodontal disease has been diagnosed, there are various forms of treatment. Gingivitis, the earliest form of gum disease, can be tackled with a few good cleanings and some improvement in brushing and flossing technique. For more significant disease, a more aggressive cleaning called scaling and root planing may be indicated. Scaling and root planing involves cleaning below the gum line with special instruments to remove bacteria and toxins from the tooth root. This is done with local anesthesia in one or more visits. For some, this is the only treatment necessary to get the gums back on track. For even more advanced disease, use of the Perioscope may be recommended. The Perioscope is a fiber optic instrument that provides 40x magnification of the tooth root on the computer screen. It allows the technician to actually see the plaque and calculus and to remove it most effectively. Removal of plaque and calculus is the key to effective treatment of gum disease. If gum infection has caused significant damage to the gum and bone supporting the teeth, a “flap procedure” may be indicated. This involves surgical access to the deep pockets, allowing for materials to be placed that will initiate regeneration of the lost tissue and bone. Remember, the first step in preventing gum disease is good oral hygiene. Brushing and flossing on a daily basis, as well as routine visits to the dentist for your check-up can go a long way in keeping your gums healthy. If you have already lost teeth to gum disease, take a look at our website, www.pittsburghimplantsandperio.com to learn about dental implants in Pittsburgh. Bisphosphonates can cause jawbone damage? Bisphosphonates are a type of medication used in the prevention and treatment of osteoporosis, as well as in the treatment of certain cancers. Just a few of the drugs included are Actonel, Fosamax and Boniva. These drugs may be taken orally or intravenously. Just about everyone knows someone that is taking one of these very common medications. You may have heard that bisphosphonates can cause a rare, but serious, condition called osteonecrosis of the jaw. Osteocrenosis can cause severe, irreversible damage to the jawbone. Having certain dental procedures can be a factor in osteonecrosis. If your doctors prescribes a bisphosphonate, (especially the IV kind), it is extremely important that you alert your dental professional prior to proceeding with any dental treatment. It is also very important to be cognizant of your dental health if you are taking bisphosphonates. Proper brushing and flossing, along with regular dental visits every six months is imperative. It is a good idea to see your dentist or periodontist PRIOR to starting a regimen of bisphosphonates. Your dental professional can assess your dental health and if there are any dental issues that need to be addressed such as gum disease, extractions, crowns, bridges, implants, cavities, etc…this can be done before bisphosphonate treatment is initiated. If you are already taking one of these drugs and a need for dental treatment arises, your dental office can work directly with your physician to determine the safest way to proceed. Sometimes, bisphosphonates are discontinued for a period of time prior to, during, and after the commencement of dental work. If your doctor has recommended that you take a bisphosphonate and you are concerned about its possible negative effect on your dental health, Dr. Weingarden and Dr. Bakuri are more than happy to meet with you to discuss your options. Why do our patients love the Perioscope? They love it because they can avoid periodontal surgery, (cutting and suturing of the gums), and end up with a fantastic result. 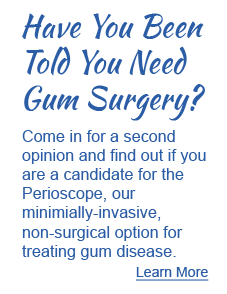 So if you have been told that you have gum disease and have avoided recommended treatment due to FEAR – fear no longer. This non-surgical treatment option is painless and costs even less than traditional surgery. The fiberoptic capabilities of the Perioscope allow the technician to see the presence of calculus on the roots, magnified 40x. The results are incredible! We have been able to avoid surgical treatment for our patients about 90% of the time. If you would like to find out if you are a candidate for this treatment, give us a call at 412-487-8288. Dr. Mark Weingarden introducing the speaker at the Omni William Penn. Doctors and staff enjoyed a very informative day. Dr. Mark Weingarden and Dr. Sam Bakuri are directors of the Pittsburgh Dental Network, a study club for dental professionals in and around our North Hills Community. 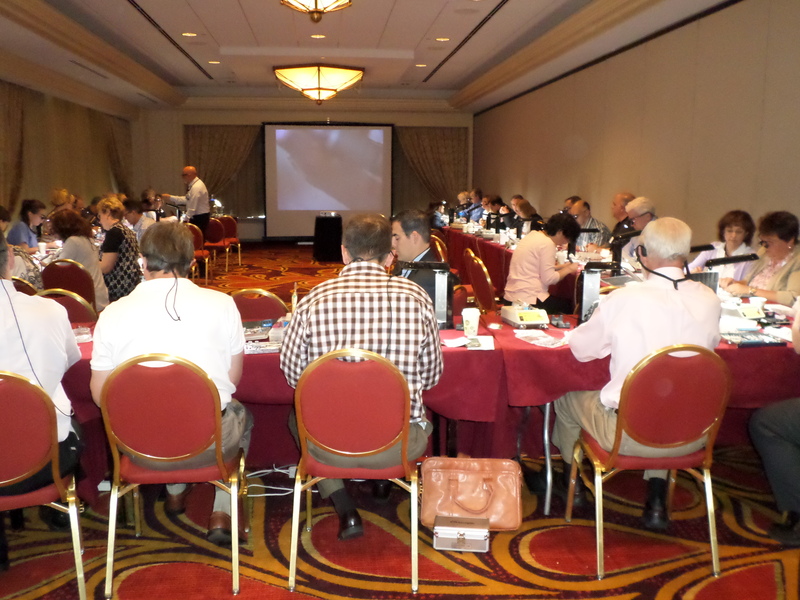 The PDN has provided outstanding, continuing education to dentists and their staff for 23 years. The 2015-2016 PDN season started off with an exceptional, hands-on program presented by Dr. Robert Margeas. This program provided new information on cutting-edge techniques for making beautiful, temporary teeth for dental implants on the spot. As many of you know, Dr. Mark Weingarden is the founder and director of the Pittsburgh Dental Network, a study group of dentists and specialists in our community. Last week we began our 19th season of the PDN. This year the PDN has 42 members and a kick-off dinner was held at the Marriott in Cranberry. The season will run from now until May 2014. 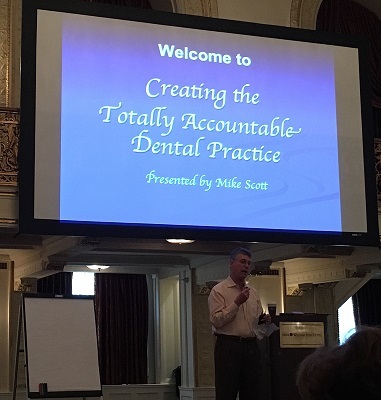 Each month brings a continuing education program to Pittsburgh, keeping our dental practitioners up-to-date with current methods and technology in dentistry. 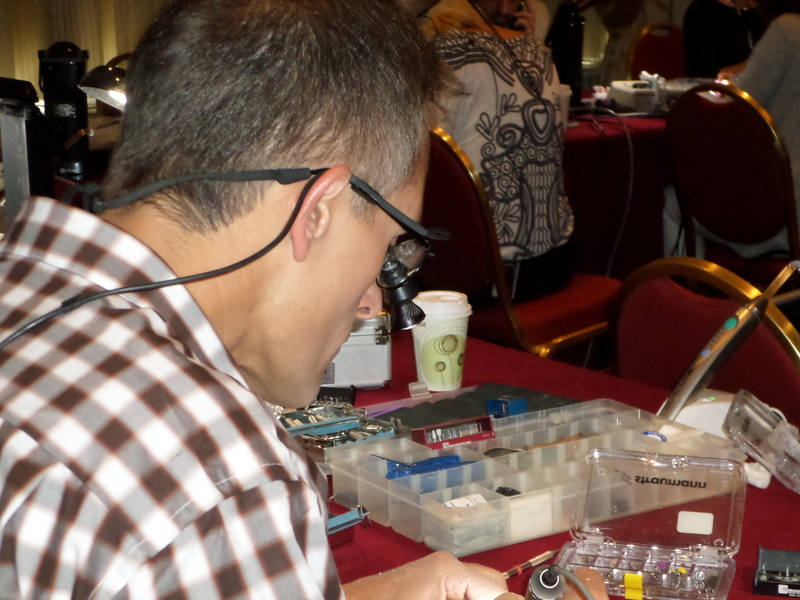 The PDN members are truly dedicated to their profession and strive to provide dental excellence for their patients! For more information on the Pittsburgh Dental Network, call Jan PDN Coordinator at 412-487-8288.